Decoding a teen’s brain, is it possible? Understand the transformation in the growing-up years and lay the foundation for respectful and responsible behavior for the future. One of the most frequent complaints one hears from parents of pre-teens and teenagers is, “He is so rude to me”, or “she is so cutting and insolent”. Most parents find the transformation of their sweet child into this whippersnapper, confusing and difficult to cope with. Research has shown that several factors play a part in bringing about this change. The most compelling being the change in the pre-teen brain. From roughly the age of ten, the brain starts ‘pruning’ its synaptic connections. (Imagine a gardener trimming down a tree to make it healthier and robust). During this process as many as 30,000 synapses may be lost per second in the early adolescent brain leading to an ultimate loss of almost one half of the synapses that were present in the pre-adolescent period. During this pruning phase, the part of the brain that is last to develop is the prefrontal cortex – the clear thinking and decision-making part of the brain. However, the emotional part of the brain – the limbic system and the amygdala are alive and kicking. 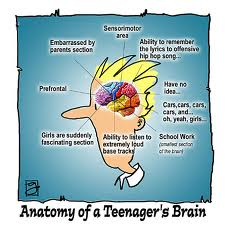 In simpler terms, imagine the teen brain as a powerful car with an inexperienced driver. The emotional brain is the turbo engine that is raring to go but the learner-thinking’ driver is still not able to keep it under control. The result of this mismatch in the developed emotional brain and underdeveloped thinking brain is impulsiveness, emotional outbursts, rudeness and the overall what-were-you-thinking behavior! Accept. Recognize that the pre-teen/teen brain is work-in progress. So the next time your kid is rude – calm down, take a deep breath and remind yourself that at times he can’t help himself, but you can – by not reacting. Remember you are the adult in the relationship. Draw boundaries. That said, remember that acceptance doesn’t mean putting up with rude behavior. Draw clear-cut boundaries on what is acceptable and what is not. Encourage open communication of feelings as long as it is done respectfully. For example, let them express their anger. This labeling of feelings and open expression helps build the frontal ‘thinking’ brain. However, let them know that you are not going to accept rude verbal (“Shut up!” or “Mind your own business”) or non-verbal communication (banging doors). Make sure you maintain composure while doing this; else you’ll only end up feeding the emotional brain and depriving the thinking on. Follow an inside-out approach. I believe that parents need to look within themselves before blaming their children. If you find that your kids are being curt, then you need to do a self check. More often than not, you will realize that you have been at fault – the nagging has been more than open communication. It is a great reminder for you to drop everything and prioritize nurturing the bonds and you immediately see them respond with double the warmth and consideration. Walk the talk. It goes without saying that if you expect your children to be polite, then you need to be more respectful towards them too. You really cannot get away with, “I can talk to you any way I want to as I am the parent” attitude. Children have very sensitive hypocrisy radars so you ought to mind your language.